Father to: Amanda (Ben Johnson), Emma (John L. Lange), and an infant son who died shortly after birth. The departed, Louis Fick, son of Johann Fick and his wife, Mary nee Knoll, long deceased, was born, June 4, 1861 in Mecklenburgh, Germany. He was soon after birth received into the fellowship of the Christian church through the holy rites of baptism. When he was four years old, his parents immigrated to this country and settled on a farm, 3 1/2 miles southeast of Beecher. Soon afterwards, they became members of St. John’s Evangelical and Reformed Church, east of Beecher, where the deceased, following a course of religious instruction, was confirmed, April 9, 1876, by the late Rev. Keuchen as one of a class of twenty-three. On Oct. 25, 1888, he was united in holy wedlock with Miss Maria Heldt, the ceremony taking place in St. John’s Church with the late Rev. G. Koch officiating. This happy union was blessed with three children, of whom one, a boy, died shortly after birth. The surviving children, who deeply mourn the passing of a kind, loving father, are Emma, Mrs. John Lange, Beecher; and Amanda, Mrs. Ben Johnson, also of Beecher. Immediately after their marriage, the young couple took up farming on the County Line on a farm known as the Fick homestead. While living here, they were faithful and loyal members of St. John’s Church. After 27 years of successful farming, they acquired and made their home on the southeast edge of Beecher adjoining the Dixie Highway. Here they were privileged to enjoy many carefree and happy years until Jan. 28, 1937, when the loving wife and mother was called into the better life. Deeply grieved, the departed carried on in Christian faith and fortitude, always enjoying the best of health and loving care of his daughter, Amanda. About a month ago, advanced age complications began to undermine his health. In order that the best of medical skill might be given him, his doctor, a little better than two weeks ago, suggested that he be taken to the Hazelcrest Hospital. However, it soon became apparent that there could and would be no recovery. And thus, Wed., July 7, around noon, his life came to a peaceful end at the ripe age of 87 years, 1 month and 3 days. He leaves to mourn his passing the two daughters already mentioned; two sons-in-law; a grandchild, Leonard Lange; two brothers-in-law; and a host of other relatives and friends. Funeral services were conducted at Hack’s Funeral Home, Saturday, July 10, beginning at 1:30 p.m., and continued at St. Luke’s Church where Rev. G. Horst spoke fittingly to a fine gathering of relatives and friends. The following, under the direction of Mrs. Rose Hunte, rendered three appropriate songs: Mrs. Leona Henerberg, Mrs. Violett Meeter and Mrs. Ester Braun. Beautiful floral pieces eloquently spoke of the esteem in which the aged pilgrim was held. 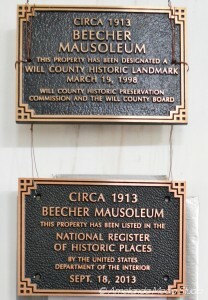 He was placed to rest in the Beecher Mausoleum. The deceased, as husband and father, gave his best to his family and home. As a Christian, former member of St. John’s and later member of St. Luke’s Church, Beecher, he ever proved his sincerity, loyalty and interest, not only in almost regularly attending services, but also in contributing liberally towards the church and its larger kingdom work. As a friend and neighbor, he was ready to lend a helping hand wherever needed. Because of his morally clean, fine Christian life, he was honored and respected throughout his long life by all who knew him. By way of farewell, we quote Isaiah 12, verse 2, 3: “Behold, God is my salvation; I will trust, and will not be afraid; for Jehovah, even Jehovah, is my strength and song and He is become my salvation.” – Contributed. 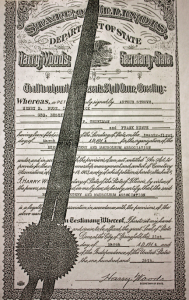 Admitted to probate in probate court yesterday was the will of the late Louis Fick which disposed of an estate at $18,000. As directed in the will, Probate Judge Fred R. Adams names a daughter, Mrs. Amanda Johnson, of Beecher, the executrix. The will was dated Feb. 17, 1937. 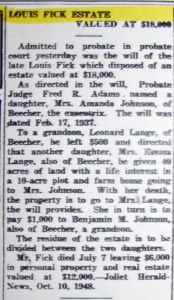 To a grandson, Leonard Lange, of Beecher, he left $500 and directed that another daughter, Mrs. Emma Lange, also of Beecher, be given 40 acres of land with a life interest in a 10-acre plot and farm home going to Mrs. Johnson. With her death, the property is to go to Mrs. Lange, the will provides. She in turn is to pay $1000 to Benjamin M. Johnson, also of Beecher, a grandson. The residue of the estate is to be divided between the two daughters. 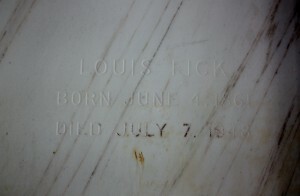 Editor’s note: Louis was also one of the elected officers on the Mausoleum Board after its construction in 1914. Click on the photo to see the list of elected officers. This entry was posted in Automated Burial Listing, Burial Listing, Burial Location, HEADSTONE, Obituaries- Have Full Copy, St. John UCC, South Beecher, St. Luke's UCC - Beecher by Sandra. Bookmark the permalink.